I call it Spring Cleaning for the Soul. Ever since I first saw this show a year ago, I have been anxiously awaiting another chance to see it. The rollicking musical is a perfect fit for the new Leeds Theatre in nearby Winchester. It’s a great message, that we are all children of God, we all are redeemed and forgiven and have our own spiritual truth to tell! ‘Smoke on the Mountain’ tells the story of a Saturday Night Gospel Sing at a small country church in the North Carolina Smoky Mountains in 1938. 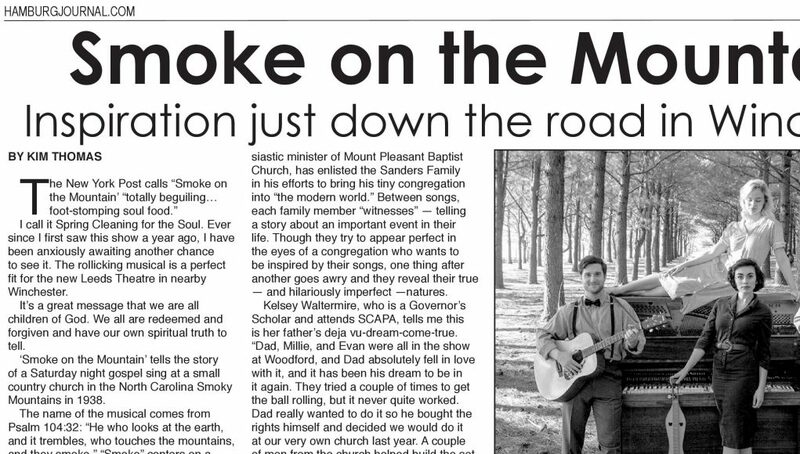 The name of the musical comes from Psalm 104:32: “He who looks at the earth, and it trembles, who touches the mountains, and they smoke.” “Smoke” centers on a gospel-sing set in 1938 in a country Baptist church in North Carolina. Called a “cornpone Chorus Line,” by Variety, Smoke will be presented by Off Main troupe, which has taken the show from Woodford to Lexington to Lancaster and garnered growing popularity with each performance. Mix the style of a Broadway musical with the story of a Saturday-night gospel sing in a rural church, and this is what you get. 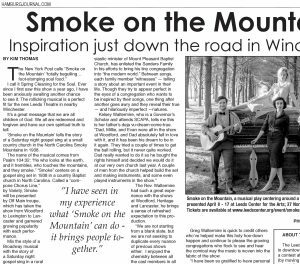 Smoke On The Mountain is near and dear to Pastor Greg Waltermire (Stanley) as he has performed it before in the wildly popular Woodford Theatre production of the musical before bringing it to his own church, Heritage Baptist last year. He then appeared in the successful Lancaster staging, and now the folks close to Winchester will have pleasure of enjoying this delightful breath of fresh musical air. Pastor Oglethorpe, the young and enthusiastic minister of Mount Pleasant Baptist Church, has enlisted the Sanders Family in his efforts to bring his tiny congregation into “the modern world.” Between songs, each family member “witnesses” — telling a story about an important event in their life. 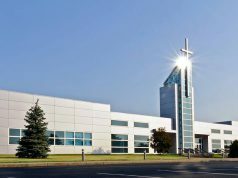 Though they try to appear perfect in the eyes of a congregation who wants to be inspired by their songs, one thing after another goes awry and they reveal their true — and hilariously imperfect —natures. “Stanley, as a part of the Sanders family, does sing solos, trios, quartets, as whole-family songs. He plays guitar throughout the show, with one brief chorus on the piano. In practice, I have experimented with some limited banjo, as well but doubt that I will have the courage to actually play it,” he jokes. Reverend Waltermire, his entire family, cast & crew are putting in an effort to make this a rousing revival of gatherings and songs that inspire the warmth of faith and family. Take Mom (or Grandpa) and the whole family to see this show – you will be singing the songs for weeks! Some of the funniest moments are “at the end of the first act, when Brother Oglethorpe (played by GB Dixon) goes ballistic because there is choreography in the song — Dancing in a Baptist Church!” laughs Waltermire. Presented by Off Main Actors Group at Leeds Center for the Arts. April 8 – 17 at Leeds Center for the Arts; 37 North Main Street Winchester, Kentucky. 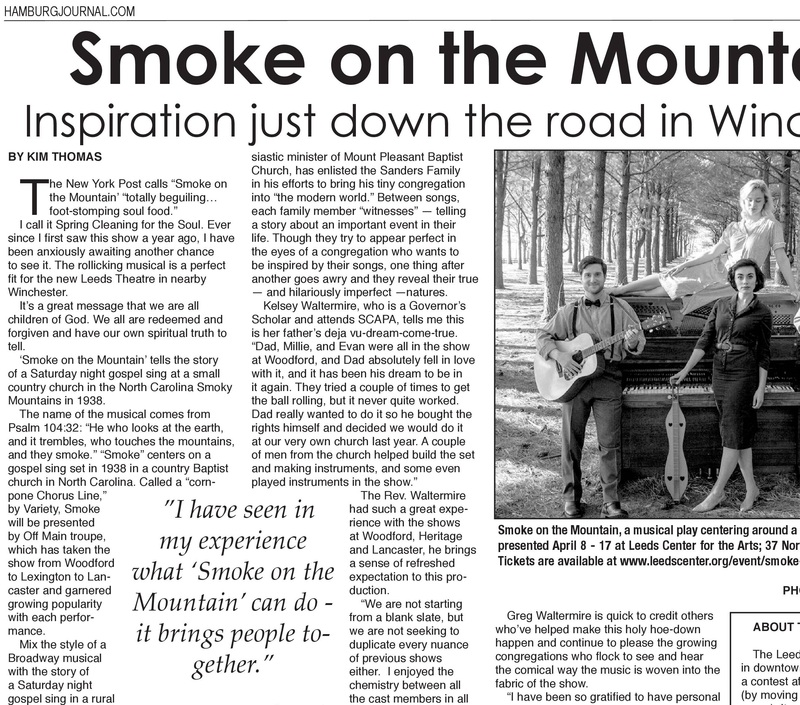 Tickets are available at www.leedscenter.org/event/smoke-on-the-mountain. The Leeds Theatre opened in 1925, in downtown Winchester, named in a contest after its owner, S.D. Lee (by moving around the letters of his name). It was one one of the earliest buildings in Winchester to have air-conditioning. The Leeds Theatre operated as one of the city’s four movie houses until 1986 when it closed, due to a decline in both attendance and the general upkeep of the theater. Soon after the Leeds’ closing, the Winchester Council for the Arts was formed with the goal of bringing the performing arts to Winchester and restoring the old theater to its original appearance. After four years of fundraising, the WCA did purchase the Leeds Theatre and restore and renovate it for over $1.5 million. This article also appears on page 7 of the April 2016 printed edition of the Hamburg Journal.